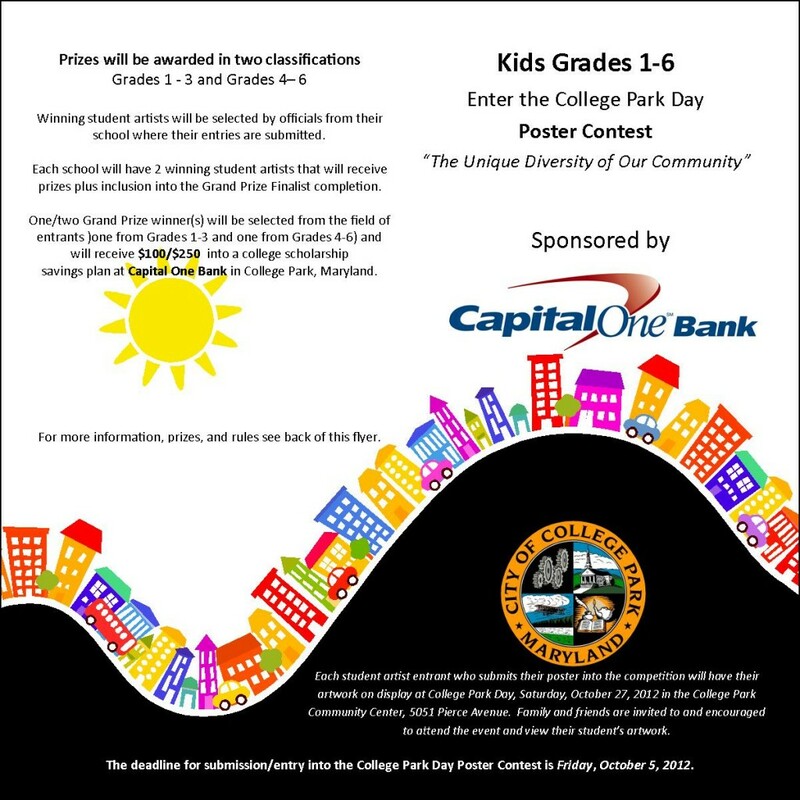 The City of College Park, as part of its celebration of the College Park community on the third annual College Park Day, October 27, 2012, is again hosting a poster contest for local schoolchildren. For the first time Capital One Bank / College Park is sponsoring the poster contest and will be awarding a grand prize of a $$ college scholarship account at their financial institution to the overall winner. Entitled “The Unique Diversity of Our Community” contest asks College Park’s children to use any medium including but not limited to: pencil, crayon, paint, or pictures to show what they think the unique diversity of College Park Community means to them. Each poster must be no larger than 11” x 17”. Prizes will be awarded in two classifications: Grades 1 – 3 & Grades 4 – 6. Winning student artists will be selected by officials from their school where their entries are submitted. Each school will have 2 winning student artists that will receive the following prizes: Automatic entry to the grand prize finalist competition with their artwork prominently displayed at College Park Day, Saturday, October 27, 2012 from 11am—3pm; Certificate presented to each winning student from the event stage by the Mayor of College Park at 2pm as the winner of their school and grade classification category; College Park Day limited edition t-shirt; and other surprises. Each school will submit their 2 winning student artists into the grand prize finalist competition. A committee of distinguished and special guests will judge the poster contest finalist competition between 11:00am – 1:30pm at the College Park Day event on Saturday, October 27, 2012. One grand prize winner will be selected from the field of finalists and will receive a $$ college scholarship into a State 529 plan or Coverdell Education Savings Plan at Capital One Bank, College Park. The grand prize winner’s parents/guardians will be contacted by the sponsor/ bank following the event to make an appointment to come to their local branch and open an account/add the grand prize scholarship money into an existing account for the grand prize winning student. The deadline for submission/entry into the College Park Day Poster Contest is Friday, October 5, 2012. College Park Day will take place rain, shine, or snow! Winner need not be present at the event to win.